George Clooney wears an Omega Speedmaster Professional Moon Watch 25th Anniversary Apollo-Soyuz special edition in Money Monster. Omega Speedmaster Chronograph Professional Moon Watch 25th Anniversary Apollo-Soyuz special edition, reference 3195.59.00. In the 2016 film Money Monster, George Clooney wears a 18kt yellow gold Omega Speedmaster Professional Moonwatch Chronograph. The watch in the film has a black dial, three subdials, gold case and gold bracelet. From the screenshots on the left we can't be sure yet if this is the a 'standard' gold Omega Seamaster Professional Moonwatch, or the 25th Anniversary Apollo-Soyuz, reference number 3195.59.00, or the more recent Omega Speedmaster Professional Moonwatch Co-Axial Limited Series 50th Anniversary Edition, reference number 311.63.42.50.01.001. This is a special edition of the famous moon watch, limited to 50 pieces. The watch is not available anymore. 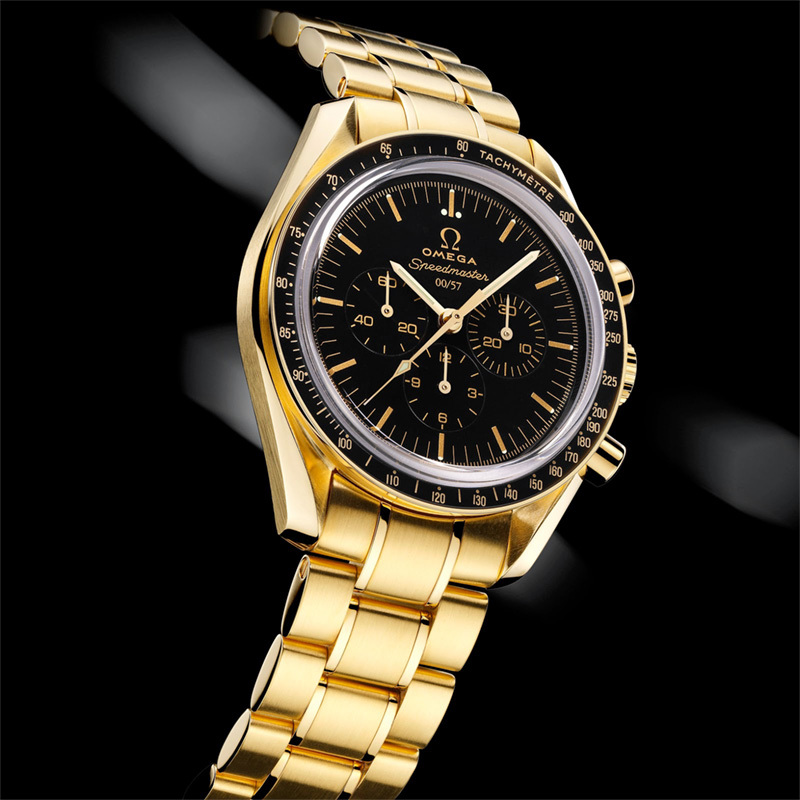 The watch features Omega 1863 famous manual-winding chronograph movement that was used on the Moon. Power reserve: 48 hours. The case is yellow gold, 42 mm diameter, with a black dial and scratch-resistant sapphire crystal with antireflective treatment inside. Solid 18k yellow gold caseback, features Seahorse engraving and stamped, '25th Anniversary, Apollo * Сою́з (Soyuz) 0x/50'. Omega 18K Yellow Gold Speedmaster bracelet with folding deployment clasp. 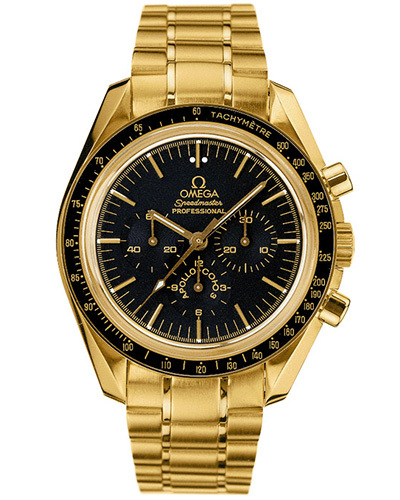 In 2007 the Omega Speedmaster Chronograph celebrated its 50th Anniversary. The watch is the first and only watch to have been worn on the Moon. To commemorate this anniversary, Omega produced two special edition collections – the Speedmaster Professional Moonwatch (Calibre 1861) & the Speedmaster Professional Moonwatch Co-Axial (Calibre 3201) which tribute to the year 1957 when the Speedmaster was first launched. The 50th Anniversary Speedmaster Professional Moonwatch Co-Axial was produced in limited edition of 57 pieces of each of the three gold versions of the Moonwatch and to 1957 pieces of the stainless steel model. In the film Money Monster it looks like Clooney wears the gold case / gold bracelet version of the Co-Axial Limited Series 50th Anniversary Edition. In Money Monster, Clooney plays a successful TV personality Lee Gates who is taken hostage by a viewer, who lost his family's money on a bad tip by Gates. The film is directed by Jodie Foster and also stars Julia Roberts, Jack O'Connell, Dominic West and Caitriona Balfe. 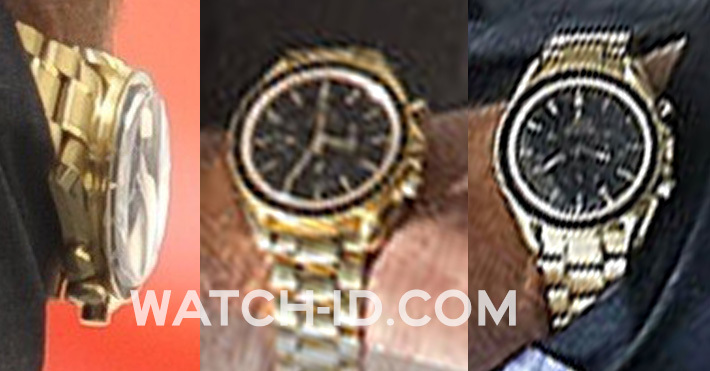 George Clooney is a brand ambassador for Omega and usuall wears Omega watches in his films, see more sightings here. In the film The American, Cloney also wears a Speedmaster Professional.